A second day of fighting between Sudan and South Sudan in their disputed border regions has prompted international concern that the conflict might develop into outright war. The African Union says it is deeply alarmed by the clashes over oilfields, and called on both sides to exercise the utmost restraint. Sudan has pulled out of negotiations with South Sudan. The fighting is the worst since South Sudan seceded in July last year. South Sudan has seized the town of Heglig, which is internationally recognised as Sudanese territory, though South Sudan disputes this. 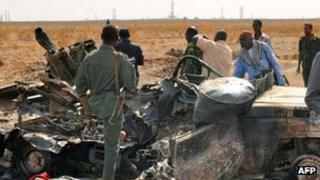 Sudan has complained to the United Nations and the AU about South Sudan's "aggression". The parliament in Khartoum called for a "mobilisation and alert" of the people. After talking to President Salva Kiir of South Sudan, UN Secretary General Ban Ki-moon said he had suggested an immediate summit between the two countries to build confidence and reaffirm that dialogue was the only solution. UN Security Council members and the AU urged the southern forces to withdraw immediately from the disputed oilfields. The US condemned South Sudan's seizure of Heglig, saying it was "an act which goes beyond self-defence and has increased tensions between Sudan and South Sudan to dangerous levels". Sudan relies on the Heglig oilfields for a sizeable part of its budget, and has vowed to use "all legitimate means" to retake them, warning of "destruction" in South Sudan. Rahmatullah Mohamed Osman, the under-secretary at Sudan's foreign ministry, acknowledged that it would not be possible to continue pumping oil as long as South Sudan controls Heglig. Mr Osman said there would be an economic impact on Sudan, but not necessarily in the short term. The country does have other oilfields. The BBC's James Copnall, in Khartoum, says many of the underlying problems between the two countries have not been resolved, with little progress in negotiations over the border, citizenship and oil - despite the optimism at the time of South Sudan's independence nine months ago. A presidential summit, which was to have been held in South Sudan's capital, Juba, at the beginning of April, has been postponed indefinitely because of the recent violence. A senior Sudanese official, Ibrahim Ghandour, says South Sudan's actions mean reconciliation efforts are now off the agenda. "We cannot talk about peace while there is an aggression," he said. "If they want peace, they have to pull their forces from the territory of Sudan." But South Sudan's military spokesman, Col Philip Aguer, says his forces are simply acting in self-defence. "We pursued them up to Heglig," he said. "We think this is our right. "We have never aggressed anybody. We have never crossed into the territories of the Republic of Sudan." He accused Sudan of carrying out air raids. In a statement , the African Union called upon both countries to resolve this and all other outstanding issues "in a peaceful way in accordance with the overriding principle of establishing two viable states in Sudan and South Sudan". Correspondents say Sudan, having lost most of its oil when the south seceded, will not tolerate losing any more.